I have always had a penchant for making breads and baking as I always say is therapeutic. It was one such day when I was feeling lost for no reason and I knew it was time to bake but bake fast. Somehow, I did not have the patience of waiting for the yeast to proof and rise, though the temperature here would have really helped that. I decided to try a soda bread which uses baking soda instead of yeast as a raising agent. The bread does not need any kneading and has a rustic texture.Traditionally the ingredients used in making a soda bread are buttermilk, soda bi carb, salt and flour. The buttermilk containing lactic acid reacts with the soda to produce carbon dioxide which produces tiny bubbles. It’s a perfect bread to be tried by novices in baking as it needs minimal effort. The soda bread is commonly made in various cuisines but the most famous is definitely the Irish Soda bread though they are not the inventors, apparently it was made earliest by the American Indians. However, as the Scots have made the bagpipe their instrument, the Irish have made Soda Bread theirs. Not by choice, but by a state of poverty that made it the easiest bread to put on the table. This bread tastes best when eaten warm, it goes well with soups and curries. It can be had as snack smeared with olive oil or tapenade. Grease a baking dish with olive spray. Mix all ingredients and using the buttermilk bring all together. Do not knead. Dust the platform with some flour and make a ball. Flatten the ball and apply milk wash. Cut a cross lightly on the top. Bake till golden brown. The loaf sound hollow when tapped underneath. 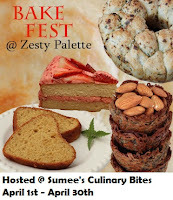 Sending this to my event ‘Only’ Snacks & Starters hosted by Raji at Vegetarian Tastebuds, Tickling Palate's, I Love Baking and Vardhini and Sumee's Bake Fest. when I dint have a good active yeast I used to bake this a lot. little denser but the flavour is awesome. your bread looks perfect. 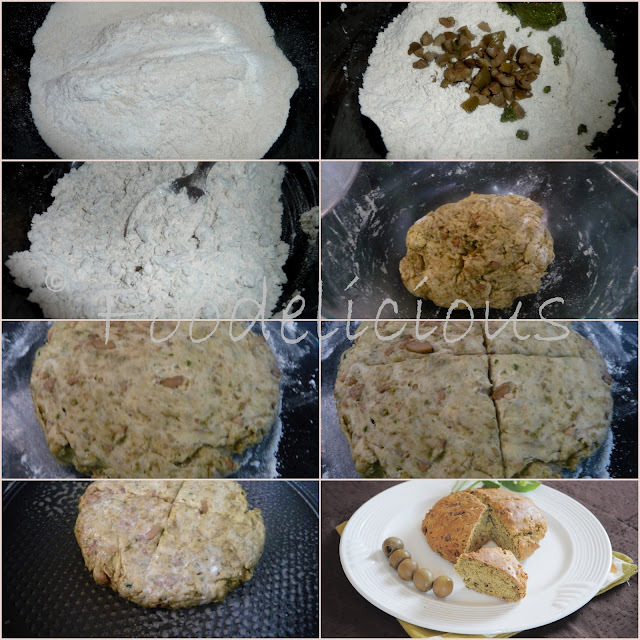 great luking bread...link it to my event teatime !!! Rightly prepared bread looks wonderful !! Your pictures looks so professional... Just like from a recipe book.. so classic..
Like the rustic look of the bread, awesome flavor with pesto in it.. The bread looks so perfectly baked! Thanks for ur lovely comment pari...this bread looks delicious..I m wondering how many cookbooks u must b having in ur cup-board...he he..:)BTW I m planning 2 make aluc urry which u posted recently,but would try wid lil oil..
perfectly done and very delicious..loves your presentation..
the recipe book looks wonderful, i too am a visual person, understand recipes better when there is a stepwise pic.. the bread looks so easy & quick! Wonderful bread...such a lovely texture. lovely soda Bread....adding olive makes it more delicious......book marked..
What a beautifully baked bread! It looks perfect and lovely presentation. Great lookng bread, seriously i love olives in bread, well done Pari..
Gorgeous bread just a replica of the pic from the book .. jus loving it esp because of no yeast in it..wonderful !! Perfect baked bread,looks so yummy. hi pari, just to say thank you for your sweet comments on my post “sago dessert” at sobha’s last week. Wow thiis something I have do. Have been feeling totally lazy for some time now.